Sen Melanie Sojourner: I disagree with those advocating for change to the state flag of Mississippi. (Natchez, MS.) - Senator Melanie Sojourner today released the following statement regarding calls to do away with Mississippi's official state flag. 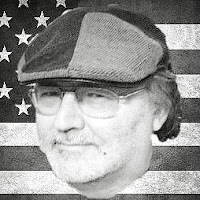 "I disagree with those advocating for change to the state flag of Mississippi. 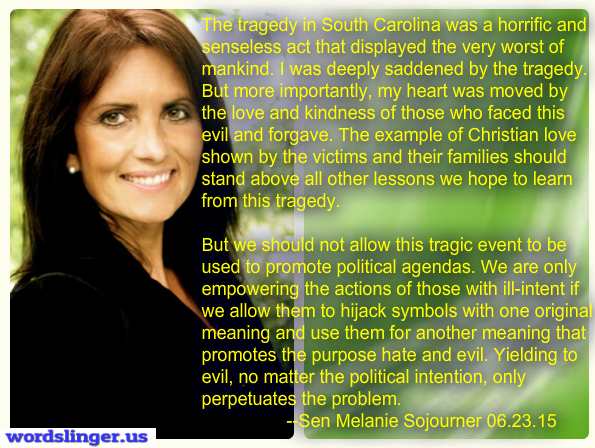 The tragedy in South Carolina was a horrific and senseless act that displayed the very worst of mankind. I was deeply saddened by the tragedy. But more importantly, my heart was moved by the love and kindness of those who faced this evil and forgave. The example of Christian love shown by the victims and their families should stand above all other lessons we hope to learn from this tragedy. But we should not allow this tragic event to be used to promote political agendas. We are only empowering the actions of those with ill-intent if we allow them to hijack symbols with one original meaning and use them for another meaning that promotes the purpose hate and evil. Yielding to evil, no matter the political intention, only perpetuates the problem. Mississippi has dealt more openly on the issue of race than any other state in the country and we have the scars to show for it. We do a terrible disservice to future generations when we refuse to be honest about our history and when we allow others who neither know nor care about our people to be the self-appointed arbiters of what is and is not a civilized discussion on the topic. The people of Mississippi understood this clearly when we decided this issue in 2001 in a referendum, and the people chose to keep the current flag.